Norbert: What Can Little Me Do? is an internationally award-winning children’s picture book inspired by a real 3-pound registered therapy dog. The story shows that you don't need to be big to make a BIG difference in the world. Norbert, a Pet Partners® dog, tells the tale through his personal artist’s journal. "You are holding my Artist's Journal about my move to the BIG city. I had no idea what a little 3-pound dog like me could do in such a huge place. I was surprised to discover the answer, and I bet you will be, too!" writes Norbert on the book's dust jacket. As the first title by Polly Parker Press, this lovable, exquisitely illustrated tale shows how a tiny hero discovers his unique gift for helping others while showing children that each person has his or her own unique gifts. This is the first book in a series. Norbert: What Can Little Me Do? is sold out. NORBERT: WHAT CAN LITTLE YOU DO? 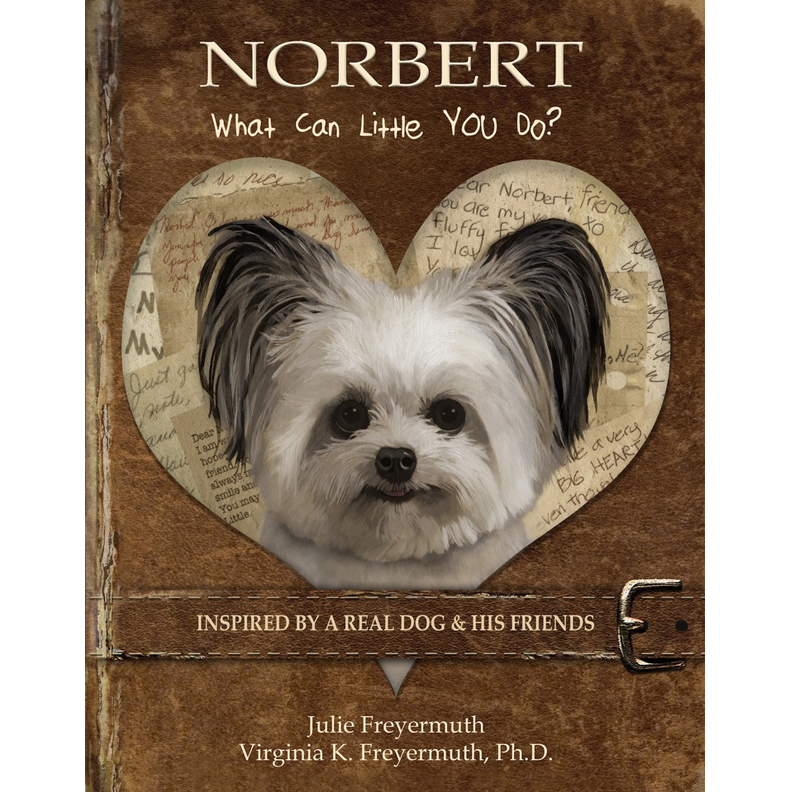 The much-anticipated second book in the series, Norbert: What Can Little YOU Do?, is a children’s picture book inspired by a real 3-pound registered therapy dog and his real-life friends: Colin, Malia, Alondra, Jeanie and Lucy. Our tiny hero is on a mission to spread kindness throughout the world. He encourages readers of all ages to think of ways to make others smile by caring, giving, and showing respect. What does it mean to be kind? There is a visual clue on every page. This book is a follow-up to the international award-winning picture book Norbert: What Can Little Me Do? Norbert: What Can Little YOU Do? is sold out. NORBERT & LIL BUB: WHAT CAN LITTLE WE DO? An exquisite, magical picture book starring Norbert and Lil BUB...with a grand purpose and a surprise ending! What will happen when a down-to-earth, 3 lb. therapy dog with a big heart meets a celestial cat with magical powers from another planet? Each one is on a mission to make the world a better place, but can these two very different creatures overcome their seemingly insurmountable differences to work together? Will it lead to something amazing, or will they go their separate ways? You’ve heard the expression “fighting like cats and dogs.” It derives from the assumption that dogs and cats just don’t get along. But what if BUB and Norbert teamed up to accomplish something remarkable? Individually they have already touched the lives of millions; just think of what they could do together as a team! Norbert and BUB have shown us that their personal differences are their superpowers. Together they can combine their superpowers to show us that despite our differences, we can all work together to create something otherwise unattainable – a collaborative effort full of love, magic and inspiration. In the tradition of Polly Parker Press, this third book in the Norbert series is a beautifully illustrated, high quality keepsake publication. Norbert: What Can Little WE Do? is sold out.